An outdoor space can look and function better by adding the right features. Accordingly, decks and arbors are great ways to make it a lot more enjoyable. Both provide a place for relaxation, entertainment, and space for almost any outdoor activity for both residential and commercial properties. We believe that decks and arbors are worthwhile investments, which is why we highly recommend them. If you are looking to have these designed and built in your outdoor space, you have come to the right place. One of the best additions to any outdoor space is a deck. It can be used as an outdoor dining area, a place to lounge in, a viewing area, or a place to entertain guests or clients. At Outdoor Escapes, we make sure that the decks we build are functional and made with quality materials, such as composite, cement, wood, or metal. 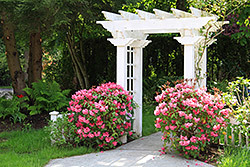 An arbor is a great addition to any landscape or garden because it is beautiful, easy to build, and functional. It is a perfect focal point and can be easily customized to fit your personal style as well as the current theme of your garden. When it comes to building arbors, we make sure that we only use premium wood. You can choose from fir, redwood, cedar, and hard spruce, which are long-time popular materials for such landscape features. When placed strategically, an arbor can provide optimum aesthetic and functional benefits. It can serve as an eye-catching break in a long pathway in the garden, a small space for entertaining guests, a mini garden from which you could hang vines or pots of plants, a decorative feature to a gate or entrance, or simply a place for relaxation. You can enhance its function by adding other woodwork such as a bench or a table with chairs. 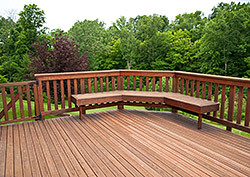 When it comes to decks and arbors, we make sure everything is taken care of. We always put tremendous attention to details when designing and building these outdoor additions in order to achieve excellent results. You are assured that our team has the necessary experience in creating beautiful and structurally sound decks and arbors. 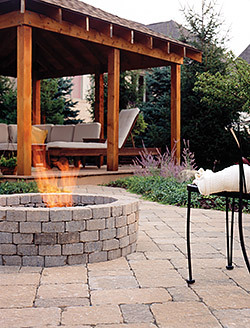 These features are sure to enhance your outdoor experience and increase the value of your home. Call us now so that we can discuss the details on how we can add these wood elements in your landscape. We have already designed and installed these for numerous satisfied clients from Grain Valley, Pleasant Hill, Oak Grove, and other nearby areas in the state.